A Skymax 127 Maksutov was mounted on an iOptron Cube Pro AZ, GOTO mount. A DFK21AU AS Camera with a 2.5 Barlow was placed at the focus. 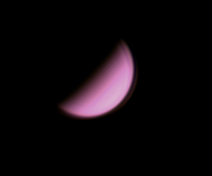 AstroDMx Capture for Linux was used to capture a 1500 frame SER file of the 45% phase Venus. The SER file was stacked in Autostakkert!2 in Wine and wavelet processed in Registax 5.1 in Wine. The final image was post processed in the Gimp 2.9.